Mike Tomkies gives a remarkable picture of the whole cycle of nature around him, in a harsh and testing environment of unrivalled beauty. Vivid colours and sounds fill these pages – exotic wild orchids, the roar of rutting stags, a pair of dragonflies mating, the flight of the redwing, the territorial movements of foxes, otters and badgers, an oak tree being torn apart by hurricane-force gales. Nothing seems to escape his penetrating eye, to which the selection of his photographs in this book – some revealing little-known aspects of animal behaviour – immediately testifies. Yet Mike’s extraordinary insights into the wildlife that shared his otherwise empty territory of 300 square miles are not gained without perseverance in the face of perilous hazards. Every pound of supplies (including heavy gas canisters) has to be manhandled in and out of his boat, which once sank beneath him in a storm. Thousands of miles of rock faces and hillside must be trekked each year in summer and winter, the tussock grass concealing sodden peat holes that will break an ankle. Hours on end, day and night, are spent in cramped hides on windy, precipitous ledges. 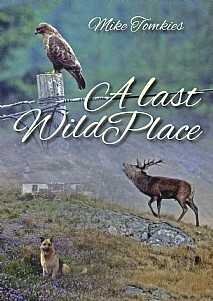 A Last Wild Place is much more than the chronicle of a man who left city life in order to study the wilderness. It is a celebration of nature at its most rugged and spectacular in all Britain. Like the enormous ageing salmon he threw back because he felt he had no right to claim its life, Mike Tomkies reveals through his quest our urgent need to become retuned to natural rhythms if mankind is to regain a measure of health and sanity in a world bent on self-destruction. This is unmissable for anyone interested in wildlife, conservation, the natural world and anyone looking for an engrossing read.